ROCKVILLE, Md., Jan. 12, 2018 /PRNewswire/ -- The rapidly expanding Cambria Hotels brand debuted in the vibrant Crescent City with the grand opening of its newest property, the Cambria Hotel New Orleans Downtown Warehouse District. The celebration was hosted by Choice Hotels International, Inc. (NYSE: CHH), franchisor of the Cambria Hotels brand and one of the world's leading hotel companies, hotel owners Fillmore Capital Partners and the management company Fillmore Hospitality. New Orleans’ own Warren Easton High School Marching Band gives the new Cambria Hotel New Orleans Warehouse District a warm welcome at the grand opening celebration. 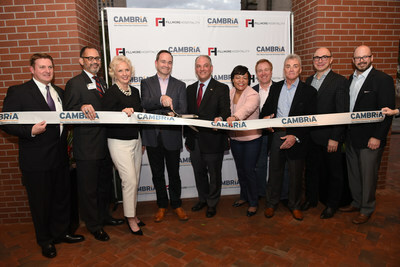 Cambria Hotels opens in the New Orleans Warehouse District, with governor John Bel Edwards and Mayor-elect LaToya Cantrell and other VIP guests. Reflective of the lively and colorful culture of the city, the event featured music from local artists, including performances by New Orleans' own Warren Easton High School Marching Band, Jazz Fest recording artist John Rankin, and award-winning rhythm-and-blues keyboardist Joe Krown. Additionally, the hotel hosted a silent auction to benefit Dress for Success New Orleans, a non-profit organization which empowers women to achieve economic independence. Party guests also toured the hotel to enjoy its unique design elements which were inspired by the mélange of style unique to The Big Easy. Louisiana Gov. John Bel Edwards and New Orleans Mayor-Elect LaToya Cantrell warmly welcomed Choice Hotels and Fillmore Capital Partners at the official ribbon cutting ceremony. Speakers at the event included Senior Vice President of Upscale Brands for Choice Hotels Janis Cannon, and President and CEO of Fillmore Capital Partners Ron Silva, who shared their excitement of entering the New Orleans market as well as the impact of the new hotel and its appeal to modern business and leisure travelers. "Ringing in the year with Fillmore Capital Partners and Fillmore Hospitality at the Cambria Hotel New Orleans Downtown Warehouse District grand opening is a fantastic start to 2018," said Cannon. "2017 was a watershed year for the Cambria Hotels brand as we continued to expand into top 50 markets with locally inspired design to accommodate the needs of the modern business traveler. The Cambria brand's active pipeline and openings will continue to grow in 2018." Choice Hotels worked with Fillmore Hospitality on this project as well as Cambria brand hotels in other parts of the country including Cambria Hotel LAX, Cambria Hotel Chicago Magnificent Mile, Cambria Hotel Southlake DFW North and the soon to open Cambria Hotel Nashville. Fillmore Hospitality is a management company that provides a full spectrum of development, investment and property management services to owners of hotels and resorts throughout North America. "We're thrilled to open our fourth Cambria hotel, especially in such a notable and dynamic city. Our collaboration with Choice Hotels has been a great experience which is why we continue to team up and open Cambria hotels," said Silva. "We are eager to help the Cambria brand expand to even more major markets, such as the upcoming property in the U.S.A.'s music capital Nashville, Tennessee." Located at 632 Tchoupitoulas Street in the heart of the city's historic Warehouse Arts District, the newly constructed upscale Cambria Hotel New Orleans Downtown Warehouse District hotel features 153 tastefully appointed guest rooms and 9 stylish suites. Outfitted with the latest in communications technology, the hotel is the perfect respite for the busy professional on the move or the leisure adventurer seeking to explore one of the world's truly great destinations. This recently opened boutique hotel marks the Cambria brand's first venture into the Louisiana market. The property is part of a growing collaboration between Fillmore Hospitality and Choice Hotels, a venture committed to developing a select group of Cambria hotels across the country. For more information on Cambria Hotel New Orleans Downtown Warehouse District, visit www.cambrianeworleans.com. Cambria® Hotels are designed for the modern traveler, offering guests a distinct experience with simple, guilt-free indulgences allowing them to treat themselves while on the road. Properties feature compelling design inspired by the location, spacious and comfortable rooms, flexible meeting space, and local freshly prepared food and craft beer. Cambria Hotels is rapidly expanding in major U.S. cities, with hotels open in Chicago, New York City, Pittsburgh, Washington, D.C., and Los Angeles. There are now 36 Cambria properties open across the United States, and there are nearly 100 hotels open or in the pipeline in the U.S. and Canada. To learn more, visit www.cambriahotelsandsuites.com. Choice Hotels International, Inc. (NYSE: CHH) is one of the world's largest hotel companies. With over 6,500 hotels franchised in more than 40 countries and territories, Choice Hotels International represents more than 500,000 rooms around the globe. As of September 30, 2017, over 800 hotels were in our development pipeline. Our company's Ascend Hotel Collection®, Cambria® Hotels, Comfort Inn®, Comfort Suites®, Sleep Inn®, Quality®, Clarion®, MainStay Suites®, Suburban Extended Stay Hotel®, Econo Lodge®, Rodeway Inn®, and Vacation Rentals by Choice Hotels® brands provide a spectrum of lodging choices to meet guests' needs. With more than 33 million members, our Choice Privileges® rewards program enhances every trip a guest takes, with benefits ranging from instant, every day rewards to exceptional experiences, starting right when they join. All hotels and vacation rentals are independently owned and operated. Visit us at www.choicehotels.com for more information. Fillmore Capital Partners, LLC, is a private investment company that engages in the development, management, and distribution of investment vehicles for institutional and select private-client investors. FCP invests on behalf of its clients in lodging, healthcare, and operating company platforms, as well as opportunistic investments in other real estate asset classes. To learn more, visit www.fillmorecap.com. Fillmore Hospitality, LLC is a management company that provides a full spectrum of development, investment and property management services to owners of hotels and resorts throughout North America. The firm's principals and executives have worked together for more than 25 years to deliver consistently superior financial results for their clients. Visit www.fillmorehospitality.com for more information.